A number of years ago I had to have cataract surgery. Gradually, scar tissue formed behind my new lenses. Last week I went in for a procedure to get it removed. In spite of the tiny black floaters that make me feel like I am surrounded by fruit flies, being able to see clearly, and not have to use my reading glasses to read was the best thing that happened to me in a long time. There are only 9 more days before election day here in British Columbia. I'm still out working for the party of my choice, and anticipate I will be even busier until it is over. Luckily my sewing machine is in getting fixed or even with my new eyes, I wouldn't get any reading accomplished. Unfortunately, I am going through sewing withdrawal. This book is hilarious! I admire so much about it. 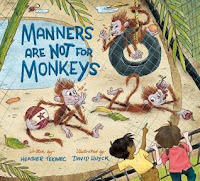 When the female zookeeper puts the monkey cage beside the picnic area and playground, the monkeys, much to the chagrin of their mother, learn manners from watching the children. This is a delightful way to teach children many positive attributes, without actually having to do much more than be entertaining. I laughed at the poor mother monkey's dilemma as she tried to teach her children to behave like monkeys. Next, a wild bunch of hooligans come to the park and try to show the young monkeys how monkeys are supposed to act. When the zookeeper comes along, she comes up with a solution to everyone's problems. I won't spoil it for you, but I have mixed feelings about the ending. It surprised me, made me chuckle, and kind of creeped me out. 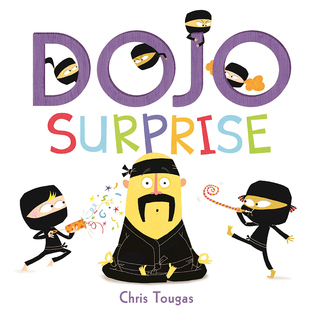 This is the first Dojo book I've read. I hope to find time for the others. While the text is written in verse with a repeating refrain, the story is mostly told through the illustrations as a gang of young ninjas put together a surprise party for their master. It's filled with humour and sweetness. Two siblings, Tess and Max, are visiting their aunt in the English countryside when they meet a young boy, William, who lives in an old castle that has been uninhabited for decades. William warns them to avoid the hawthorne trees that grow in a hedge along the property. The children are enthralled as William introduces them to all kinds of flora, fauna, and mechanical wonders on the castle grounds. A somber, secretive feel infuses this book. There's a supernatural component but it doesn't get too intense and scary, not even for scaredy cats like me. It's perfect for younger readers who like a little suspense and creepiness. In the early 1940's, Kenny's older brother, Micky, plays baseball for the Asahi team in Vancouver, BC. Following the Japanese attack on Pearl Harbour, and declaration of war against Canada and other countries, anti Japanese sentiment grew. Through Kenny and his family, readers see what happened and the impact it had on them as they eventually end up in an internment camp. Kenny, who always been considered frail because of a suspected heart murmur, ends up coming into his own, and showing his family, his community, and himself, what he is really capable of. I'm conflicted about this book. It's well enough written, but this story about the Asahi baseball team and Japanese internment is written by a white woman. I appreciate Crystal Brunelle for responding to my tweets asking how it is possible for a white reader to respond to a book under these circumstances. 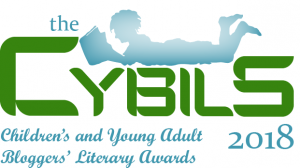 Ordinarily, I wouldn't even read it, but this is a Chocolate Lily candidate. I'm especially uncomfortable in this instance, that not only is Schwartz telling another culture's story, she is a local instructor of creative writing. It feels so wrong. I can't help but think of these words by Jacqueline Woodson when she visited Vancouver, "How can I tell my story when your foot is on my throat." In the end, I've handed the book off to a Japanese Canadian friend to read before I decide what to do. Not only will it be informative, it will be fun to get together over wine to talk about it. There are some good parts in this book. 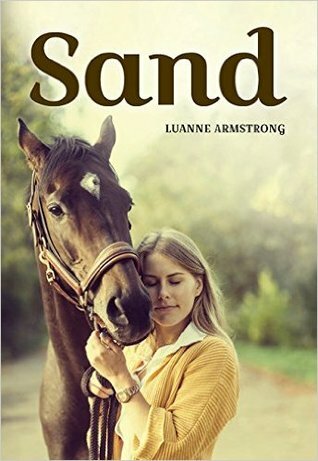 This is especially true in the passages that deal with therapy horses, where the author's personal experience shows through. Otherwise I have many problems. The young teens don't feel authentic. Their use of jargon strikes a dissonant chord. Then there is the issue of Willa's response to finding herself paralyzed after a traumatic car crash. Having lived with someone following their own experience with this, I understood her anger. Yet as the story progressed it lacked continuity and authenticity. Moreover, I was constantly appalled by the use of the word 'cripple'. This is a quietly profound, beautifully written book about two young people, Saeed and Nadia, who fall in love against a backdrop of revolution in an unnamed country. We see how they adapt and change as conditions worsen. Eventually they manage to find a magical door that takes them away. What follows is a strangely surreal journey into new places that lead them to new doors and new experiences. Along the way they drift apart. There is an ethereal quality to their journey that manages to reveal truths about present day reality for immigrants, refugees, and the people whose lands they find themselves in. The best thing about this book was how, from the first time Saeed and Nadia smoked a joint together, I found myself looking at immigration, refugees and immigrants in new ways. I've started The Missing Skull by John Wilson and am listening to Rising Strong by Brené Brown. I still can't find my 'hidden in a safe spot' copy of Pandas on the Eastside, but I know there is a copy at Dickens so I'll ask my friendly teacher librarian there to loan it to me. I've got a mess of Netgalley titles on the go, but I'm swamped with these Chocolate Lily books. I've got a copy of The Inexplicable Logic of my Life by Benjamin Alire Sáenz that has to be returned to the library soon, so I'm starting that ASAP! 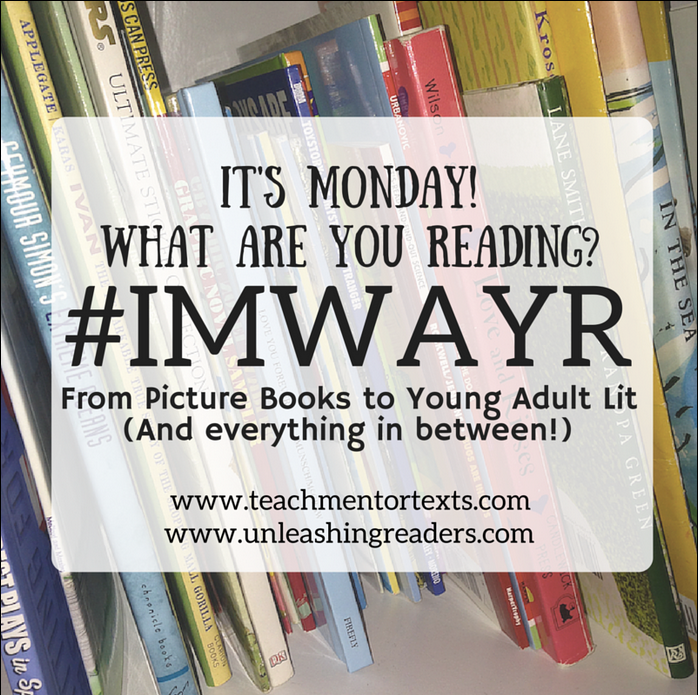 I'm also committing to read The Griffin of Darkwood by Becky Citra and Seeking Refuge, a graphic novel by Irene N. Watts and Kathryn E. Shoemaker. Manners are Not for Monkeys sounds very funny. I'm intrigued by the ending! I liked it, but I see that there are issues with it. I enjoyed The Castle in the Mist. The Dojo series sounds fun. I love the mini ninjas on the title. The Dojos are a fun bunch who I am looking forward to reading more of. Castle in the Mist sounds good. I would read anything with a castle, English countryside, and a bit of mystery ;) Thanks for sharing so much! 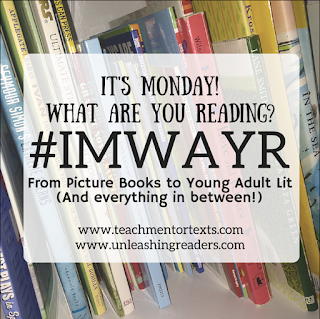 It is a good read and perfect for younger intermediate ages students. 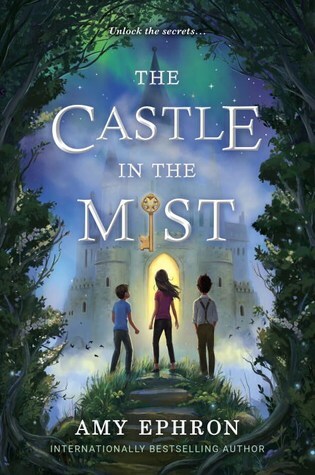 Castle in the Mist has been in my pile for sometime but I hadn't heard anything about it. Thanks for reading and reviewing! They are supposed to disappear. Cataract surgery was a godsend. I went from thinking my glasses were always dirty, to being almost able to function without them. It takes a lot longer for them to prep you for the procedure than the operation itself. The scar tissue isn't really common, but happens to some of us. It was even simpler to deal with. Good for you for hitting the pavement in this election! I'm so impressed that we have so many ways to votes, I really hope it encourages more people to exercise their right and responsibility! 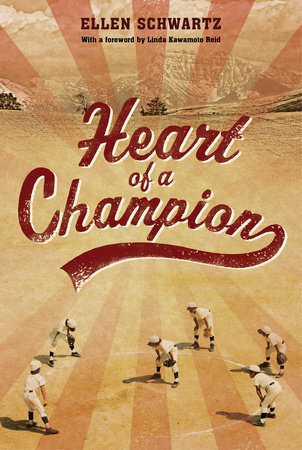 I really appreciate your thoughts on "Heart of a Champion" - it's such an important period in our history that needs to be explored and shared with young people, and the story of the Asahi Tigers is a fascinating one, but the stories need to be told in an authentic and responsible way, and I share your concern with this. Thanks Jane. It makes me really uncomfortable to be critical of this work, but authors, especially ones who teach other authors, need to know better. I need to have cataract surgery too, Cheriee, and you've made me feel better about it. Thanks for your honest reviews. I appreciate them. Looks as if I need to be sure Castle In The Mist on my "pile" of to reads! Cataract surgery is a piece of cake. Thanks Linda. 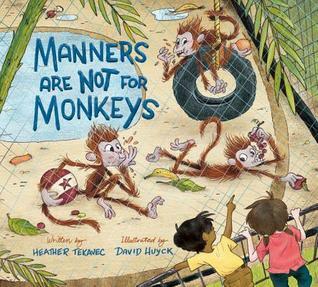 Manners Are Not for Monkeys looks like an adorable book. I'll have to look for it. Glad your cataract surgery went well. The illustrations are adorable and it is laugh out loud funny in places. The Dojo and Monkeys look like so much fun! I've heard things about Castles in the Mist. Glad your surgery went well, and I hope the election does as well. I especially hope the election goes well. But even if it doesn't, I forgot to mention that I'm listening to Rising Strong, and know it's worth all the risk. Very interesting thoughts on Heart of a Champion. I caught some of the tweets about it. Thanks Earl. At this time I'm so conflicted that I think I might not recommend the book. Thanks Myra. 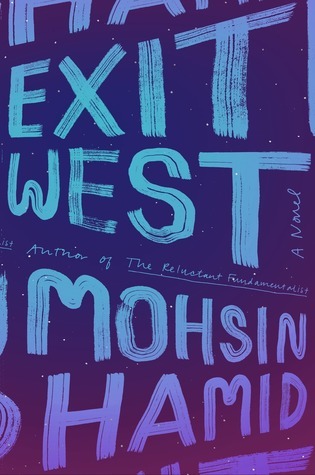 Exit West is just stunning.